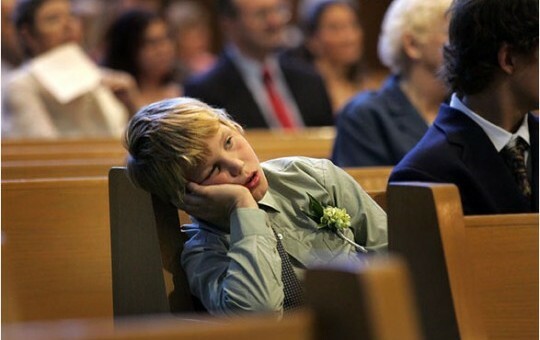 Being bored in church is an all-too-common phenomenon. I think that it’s much more than an inconvenience: it produces bad faith. Bad worship is an all-to-common phenomenon in our churches. As I’ve traveled around quite a bit in the past 7-10 years, I’ve experienced choirs reminiscent to the movie Sister Act to no choir at all; preachers that have absolutely no life to preachers with a little too much life and no tact (I’m looking at you priests that preach about abortion on Christmas or tell your congregation that voting for a particular candidate is a mortal sin); lectors that are impossible to understand to lectors that would be better suited for a kindergarten class; congregations that range from disinterested to indignant. As I began to notice the lack of consistency from church to church, and left many “celebrations” of the Eucharist with a feeling ranging from emptiness to anger, I asked myself this question: “Is bad worship better than no worship at all?” It’s an interesting question that I’ve asked myself and many priests over the past three years with a wide range of responses. The biggest difficulty in answering this question, I think, is coming to an appropriate definition of what “bad worship” really is. In one sense, this means determining what is essential in making the mass a valid sacrament; in another, it means determining what best allows for the sacrament to be received and reciprocated. Put another way, there are both objective and subjective elements to the mass. The objective elements of the mass are easy to understand and evaluate because, well, they’re objective. Were the words of consecration said? Did the presider use bread and wine? Was the presider an ordained member of the priesthood, and did he have the appropriate faculties? All of these questions, among others, help to determine whether or not the mass was in fact valid, or in other words, that the sacrament really happened. Rarely is this ever an issue, and even if it is question, there are a few safeguards for the people. For instance, Ecclesia Supplet, canon 144.1 in the Code of Canon Law, says that the “Church provides” governance when it may otherwise be in question, as in the case of a priest not having faculties. In the case that a priest may not say the exact words of consecration, Pope Pius V declared in the papal bull De defectibus that the sacrament remains valid, even if the words have been changed, as long as the new words do not change the original meaning. Even in the case of a priest in the state of mortal sin, or with malicious or indifferent intentions, the Church has argued since the Donatists of the 4th century that mass is in fact valid. Since it is actually Christ that is conferring the grace through the sacrament, the Church says that it is “by the very fact of the action’s being performed,” not the state of it’s celebrant, that matters (Catechism of the Catholic Church 1128). In this way, we may take solace in the fact that no matter how bad the music may be, how boring or offensive the priest’s homily may be, how terribly ugly the religious vestments or sacred art may be, or even how terrible of a person the priest may in fact be, we are receiving God’s grace by partaking in the action. For this reason, unfortunately, some presiders and church leaders end their concerns here: if the elements are present to make the sacrament valid, what else could possibly matter? There are plenty of things that matter! Preaching and music have a critical importance to the worship experience. Art is a gateway into the transcendent. One would think that interaction with a community of believers would be paramount to the experience. I believe that the subjective elements are much more than simply peripheral perks of a grace-filled experience, though. I believe that they are essential to good faith, and are equally important to having a graced experience as the objective ones. As I’ve mentioned before, “Faith grows when it is well expressed in celebration. Good celebrations foster and nourish faith. Poor celebrations may weaken and destroy faith” (Music in Catholic Worship: 6; 1983). To say that preaching and music are simply aesthetic, non-essential additions to the what really matters, the words of consecration, is nonsense. Sure, the objective elements may remain the same, and God is equally present no matter how it is performed, but isn’t the one receiving the grace much more willing to accept it if they are in a welcoming, engaging, inspiring, beautiful environment? There is a reason that the church builds transcendent buildings, installs captivating art, requires a homily, and encourages that many parts of the mass be sung: each of these make a tremendous difference in worship. The fact of the matter is that Christ’s words, no matter how poorly spoken, are still the words of Christ. Can I really say that the power of Christ is dependent on the charisma of a single man or choir? I cannot. To hear them in any context, in any form, is a blessing. The quality of the sign does not affect the fullness of grace. But on the other hand, I do not want to promote a theology that borders on magic: the words are said, things happen. There’s something more going on at mass than those words; more than the transcendent; more than God acting upon us. Eucharist is an act of thanksgiving: it is a meal that must be done in common, with active participation, in love. The liturgy is by its very nature a drama, and should cause and assist a memory of Christ. To remember the words of a lover, “I love you,” holds it’s meaning no matter the context; to remember these words with another, done in an emotionally and aesthetically provocative way, effects an experience that has more meaning than it’s original words because they begin to participate in history as it is today. This is entirely impossible without inspiring, well-executed subjective elements. So, is bad worship better than no worship? Barely. But it should not be tolerated in our churches. There is an experience of God that is possible that heightens our faith and builds our communities. Why should we ever settle for less? Good preaching, good music, good art, and good community are essential to good worship. I pray every parish pastor who hasn’t approved a Lifeteen program could read Fr. Casey’s blog. Second, if our next generation of religious cultivate from Lifeteen programs, our future is quite bright. As evangelist Richard Lane says, “It’s time to learn from our Protestant friends. Church can be enjoyable!” We’re all proud of you, Fr, Casey! Great thoughts Casey! But praise God, I am at a parish who is blessed with a messenger that preaches the word with excitement and love. Continue to grow in faith Casey. We at St. A’s will be so excited to hear you express God’s word. Good worship/bad worship – there will always be some of each in every community where there are Catholic Churches – but it’s no one’s fault but our own. At some point, we have to stop blaming others and get involved. If we don’t like the way our priest is preaching, speak to him in a loving way and offer suggestions. If we don’t like the music, see if you can bring in more programs. Suggest a Life Teen program for the middle school and high school youth. Get involved with teaching CCD if you think the program could be better. If you try hard and you don’t get positive feedback, there’s always the Catholic Church down the road. If you’re only going for the preaching and the music, you might as well try an evangelical church, that’s what they do best. If you’re there for the True presence of Jesus, open your heart (and close your ears if you have to! ), come to the Mass. He’ll be there every time, in every Mass, (good or bad), throughout the world. Keep up the good work Casey!